ProColorRing™ Bruise Makeup Palette by Mehron includes all of the various colored Professional Makeup needed to create the different colouring of the stages of a bruise. 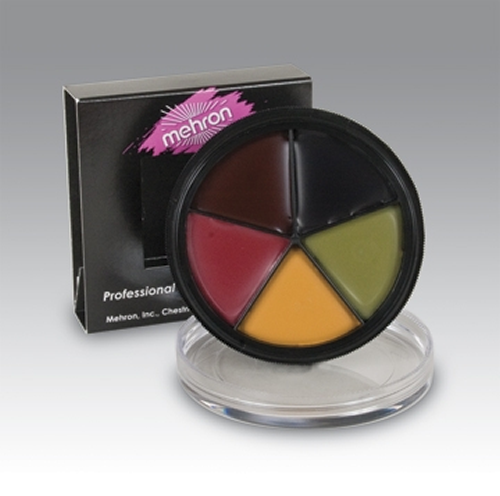 Create realistic looking bruises with the Professional Special Effects Makeup of the ProColorRing™ Bruise Makeup Palette by Mehron, leaders in Theatrical Makeup since 1927. The palette of the ProColorRing™ Bruise Makeup contains the colours needed to create bruises from the initial red of a fresh bruise to the yellowish-blue-green of a healing bruise. The ProColorRing™ Bruise Makeup Palette contains: Bloody Rose, Midnight Sky, Burnt Maroon, Spanish Olive and Maize Yellow. Propylene Glycol Dicaprylate/Dicaprate, Isopropyl Myristate, Ozokerite, Mineral Oil/Paraffinum Liquidum/Huile Minérale , Silica, Kaolin, Sorbitan Sesquioleate, Tocopheryl Acetate (Vitamin E), Ethylhexyl Hydroxystearate, Propylparaben , BHA, Talc. May Contain [+/- CI 77891 (Titanium Dioxide), CI 77491, CI 77492, CI 77499 (Iron Oxides), CI 77007 (Ultramarines), CI 77489, CI 77288 (Chromium Oxide Greens), CI 15850 (Red 7 Lake), CI 15850 (Red 6 Lake), CI 19140 (Yellow 5 Lake)]. Click here for a material safety data sheet on the Mehron ProRingColor™ Bruise.